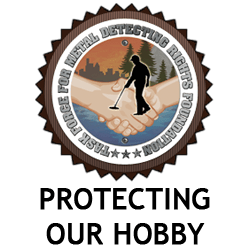 I have always been very passionate about the Task Force for Metal Detecting Rights and its mission of promoting and defending our rights as detectorists. For that reason, I recently took on the task of “Social Media” person for the organization. I like to say “I complained so much they gave me the job”, but in reality, there was a need, and I wanted to help. I will be posting updates to the Task Forces website, Facebook, and Twitter pages, and of course Detectingdiva.com as the information becomes available. That said, I am not a spokesperson for the organization, and questions regarding current situations should be directed through the contact link on their website www.detectingrights.com. As of right now, nothing has changed since the last Facebook update. The Task Force is still waiting to hear back from NY Parks. The attorney followed up with them, and confirmed with their legal office that a response to the Task Forces letter is being worked on. Regarding Cook County, the attorney, Anne Shaw, has been working with the head of the Chicago club, Patrick Anderson on a letter which the Task Force expects to receive for their review shortly. Hopefully there will be more information after this weeks Task Force Meeting. Thank you for your patience and support. You are obviously good in the social media arena. Thanks for caring enough to not just complain, but to get involved! Thanks so much Ron. Sometimes you just have to take things head on. Wish you much luck with your “Dig Wars” endeavor. I saw it the other night, and was pleasantly surprised. Keep up the good work–You Rock also! Hmmm, I want to know what that means?